Ajak is a habitat in Rétköz in Szabolcs-Szatmár-Bereg County with unique folk art, folk art traditions. The people living here for a long time have preserved their customs, traditions and dance traditions, as well as various traditional elements in the items they have used. 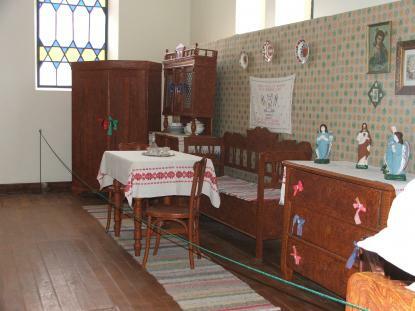 The exhibition shows the clean room of a wealthy peasant family, which evokes the period of the 1930s and 50s. The former owner of furniture and accessories is the painted in the picture Miklós Feskó Nicholas, who died in 2013. The Rétközi Museum bought the furniture from them, as well as the costume pieces, and textiles used in the household. Ajak from the point of view of vernacular architecture belongs to the Plains areas of housing types. Among others, this type of housing is characterised by tripartite rooming, where the premises are in-line, that is, the room or the atrial and ventricular atrium room (kitchen) come one after the other. The house turns its short end towards the street, the entrance opens from the long courtyard facade. The two-room peasant house was not uncommon in the 18th century, but its popularity and spread was observed only in the second half of the 19th century. With the second room came the clean room the construction of which was widespread in the Plain in the late 19th century. The clean room was the representative room of the house. It was rarely, used, mainly on festive occasions. The room was an expression of social status in the village, where the family stood in society. The furniture in a clean room were more ornate, were of better quality than the ones used in the room where the family spent life. In the peasant dwelling houses the furniture layout was basically done in two ways: in parallel (central) and angular layout format. In this region ‒ therefore in Ajak as well ‒ parallel layout of furniture was typical. In corner of each wall opposite the entrance there were a bed each, with chairs in front of them. It was in the middle of the table, facing the door, with an armbench behind.. The dresser was on one side of the bench,with a glass-door cabinet on the other side and a sideboard, which was called sifon or sifony.. A chest of drawers in the room was the cult place in the house, with statues of saints on it and holy pictures above. Now there is a cradle in the room indicating that a newborn came into the family. In order to preserve health and keep harmful spirits away not only the cradle, but the cabinet, chest of drawers were all bound in red tape. The traditional peasant furniture were often decorated in Ajak with a technique called graining, which was actually a noble way to grain paint wood that looked like wood's natural pattern. Formerly Balázs Razinger ‒ the furniture on display were purchased from him ‒ és and the master carpenter Illés Kovács made furniture of this style in Ajak.